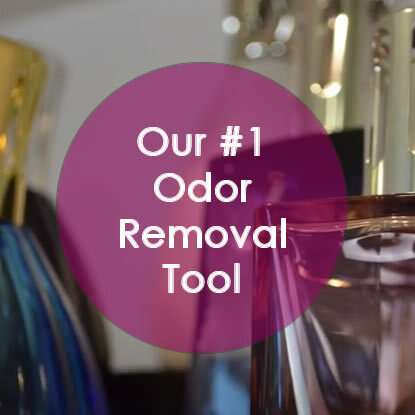 Lampe Berger is our #1 tool for removing odors of all kinds such as cooking odors, pet odors and cigarette odor. Lampe Berger was designed over 100 years ago by French pharmacist, Maurice Berger, to purify the air in hospitals. These lamps also fragrance the air, and there are over 40 different fragrances available as well as many lamp styles. Fill the lamp 2/3 full with Lampe Berger fragrance oil. Insert the wick firmly into the lamp pressing down on the metal ring. If the wick is completely dry, let the lamp sit with the cap on for 20 minutes so the wick can soak up the oil. Light the Lampe Berger wick burner. The flame will be large but there is no smoke or soot. After 2 minutes and blow out the flame. Put the vented cap on the lamp. Now the lamp is working and there is no smoke or flame. You know it’s working if you feel a little heat coming off the top of the lamp and you can smell the fragrance in the air. After 20 minutes carefully remove the vented cap (it can get hot) and put the solid cap on to stop the lamp. The fragrance will continue to linger for a few more hours. Only let the Lampe Berger to burn for 20 minutes. Be careful to not fill the lamp more than 2/3 full. It needs air to work. While the lamp is working, it will continue to burn through the oil until you put the solid cap on. If you want to extend the life of your oil, simply put the cap on earlier. If you forget to put the solid cap on, the lamp will continue to burn until it runs out of oil and then stop. Only use Lampe Berger oil in your lamp. Anything else can clog and damage your wick or be a potential fire hazard. Be sure to completely blow out the flame before you put the vented cap on. Never put the vented cap on top of a flame. It will melt and damage your lamp. Never disassemble the wick/burner. Lampe Berger wicks are meant to be one piece with a wick connected to the ceramic top by metal. Light the ceramic stone top, not the cotton wick. If you find your Lampe Berger fragrance to be too strong, you can dilute it with Neutral fragrance oil. You can use as much Neutral oil as you like to soften any scent. Even a lamp full with Neutral oil and just a tablespoon of scented oil can be enough sometimes. Neutral oil on it's own can smell too sterile, though, like a hospital. Lampe Berger fragrance oil is a much better value in the 1-Liter size. You get twice as much fragrance oil for only about 50% more in cost. Once you know you like a fragrance, be sure to buy it in the large bottle. Not all fragrances are available in the larger size. Ocean Breeze, Orange Cinnamon and Winterwood are the best selling Lampe Berger fragrances if you're not sure what to try. Summer Night fragrance oil is a bug repellant to keep mosquitoes away. This scented oil can only be used outside. I have a lamp dedicated to this one scent for that reason. It's been incredibly handy and I highly recommend it! When you transition from one fragrance to the next, the old scent is still in the wick and will contaminate the new fragrance you add. Floral and citrus fragrances typically transition very well from one scent to another and the blend can sometimes be more enjoyable than the singular scent. If you don't want the fragrances to blend when you transition use Neutral fragrance oil in the lamp between scents to remove the old scent before you move on to the next. If you don't mind a small bit of blending, add just a little bit of the new oil to the lamp and burn that off and then add more. That way, only a small of oil is contaminated and each subsequent time you add oil the scent from the previous fragrance will diminish. Some fragrances don't blend well at all. If you switch from one type of fragrance to another frequently, you might want to have 2 wicks - one for citrus fragrances and one for florals (for example). The next step is to just get 2 or more lamps - one for citrus and one for florals (for example). In our house I have a lamp in my kitchen for citrus scents to make it smell clean, florals in our living room for a more elegant effect, and woody fragrances upstairs for a more cozy atmosphere. If your Lampe Berger wick won't light it may be too dry. Let the wick soak in the lamp with the solid cap on for 20 minutes before trying to light. Is it wet with water? The only liquid that can come in contact with any part of the wick is Lampe Berger oil. If the wick was wet with water, simply let it dry completely and then let it soak in the lamp as noted above before trying to light again. Essential oils or other scented lamp oils can damage the wick. If the lamp wick came into contact with any liquid other than Lampe Berger oil you will likely need a Lampe Berger wick replacement (at your expense - they aren't too terribly expensive). Lampe Berger wicks typically last a year with average use (about 250 uses). If you have been using your wick frequently or for a long time, it may be time to replace the wick. If your wick is clogged, Lampe Berger wick cleaning is easy with Neutral fragrance oil. Simple fill your lamp with only Neutral oil and let it burn with just that until the wick unclogs. It's good practice to use a little bit of Neutral between fragrances to keep your burner working efficiently. Your Lampe Berger stone does not need cleaning. It gets darker with use and that's normal. Never use soap or other cleaning products on your wick or the ceramic stone burner. The wick needs air to work and sometimes gets too bunched up where it pinches together to fit through the metal ring. To let more air through the wick, unfold a paper clip and stick it up the wick, between the two pieces of cotton cord. Do this carefully to not damage the wick. There doesn't need to be a big gap, just enough space for air to get through to the hole in the stone top. Never disassemble the wick/burner. There is too much oil in the lamp (it can't be more than 2/3 full with oil). The wick is old and needs to be replaced (see notes above about the wick). The wick needs air to work (see notes above about the wick). There is, or was, something other than Lampe Berger oil in the lamp (see notes above about fragrance oil). If you have an absolute need to clean your lamp, wash it out with a touch of mild soap and lots of water. Make sure you rinse the lamp completely and let it dry completely before adding any scented oil. Only rinse the wick with water and nothing else. Make sure it dries completely before putting it back in your lamp. You can soak it in Neutral fragrance oil, if you must, to try and get rid of an unpleasant scent. If you have any questions or need additional Lampe Berger instructions, please leave a comment below. We hope this Lampe Berger How To Use Guide was helpful and that you enjoy your new fragrance lamp!